Việt Nam are half way to the final of the AFF Suzuki Cup. They go into the second leg at home on Thursday with a narrow 2-1 lead and are on course for the country’s second major final this year. Despite being played in Panaad Stadium in Bacolod, you would be forgiven for thinking Việt Nam were the home team. They started brightly, with the midfield snapping away at the Philippines like terriers hungry for the ball. Just five minutes in they had a chance to cause problems. Nguyễn Trọng Hoàng was fouled down the right flank giving the visitors a perfect chance to put the ball in the box, but the free kick was wasted. Việt Nam continued to press in the right areas, moves that mirror Liverpool FC’s own aggressive offensive style. It is clear coach Park Hang-seo has been watching Jurgen Klopp’s team and copying their tactics. 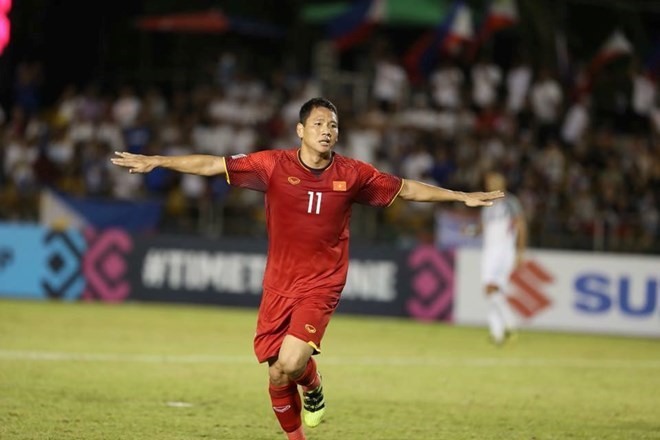 On 12 minutes, Đỗ Hùng Dũng picked up the ball on the left and floated an inch-perfect cross into the box. Striker Nguyễn Anh Đức still had plenty to do. His looping header from the edge of the area foxed the home side’s goalkeeper and found the back of the net. The lead was well deserved. Minutes later they should have doubled their advantage. Phan Văn Đức played a neat one-two with Dũng and after jinking his way into the box sent his shot agonisingly wide of the post. Minutes after receiving a yellow card for a move that wouldn’t look out of place in a wrestling ring, Nguyễn Quang Hải had a perfect change to put the home side two up. After he was found with time and space in the box, Hải was in two minds to head or kick. He did neither and the chance went away. That miss seemed to spur the home side into life. Slowly as the half came to a close they clawed their way back into the game. Keeper Đặng Văn Lâm had to be focused to keep out a strike at his near post on 28 minutes. As the first half draw to a close the host’s drew level. A fine finish from Patrick Reichelt from close range put the scores level at half time. After the break Việt Nam dominated and within just three minutes of the restart took the lead once more. Văn Đức found himself clean through on goal from a neat pass by Trọng Hoàng and he kept his cool to slot home. Ten minutes later Anh Đức had a glorious opportunity to put the match to bed but missed with his effort. As the game drew to a close Sven Goran Eriksson’s men tired and rarely threatened. In the dying seconds Việt Nam should have scored a third. Substitute Nguyễn Công Phượng broke free on the left and after tricking his way around goalkeeper Michael Aksel Bataican Falkesgaard and with the goal at his mercy somehow managed to shoot wide. A third goal would have been the icing on the cake and almost secured a spot in the final, but it wasn’t too be. Instead Việt Nam take a 2-1 lead into the second leg on Thursday at Mỹ Đình National Stadium. A lead maybe, but still this is only half time and there is still lots of work to do before Việt Nam can confirm a place in the final. The other semi between Thailand and Malaysia still hangs in the balance after they drew 0-0 at Bukit Jalil Stadium in Kuala Lumpur.